The company Royber, , the maker of Royberjigs, has now converted all his bait on the magnetic hook holder. The advantages of the glued on rubber fish Stinger magnets are just enormous for sea fishing. Again the magazin Rute & Rolle has presented the Stinger magnets. In this issue we cover the application for sea fishing. To read the report, simply click on the image. 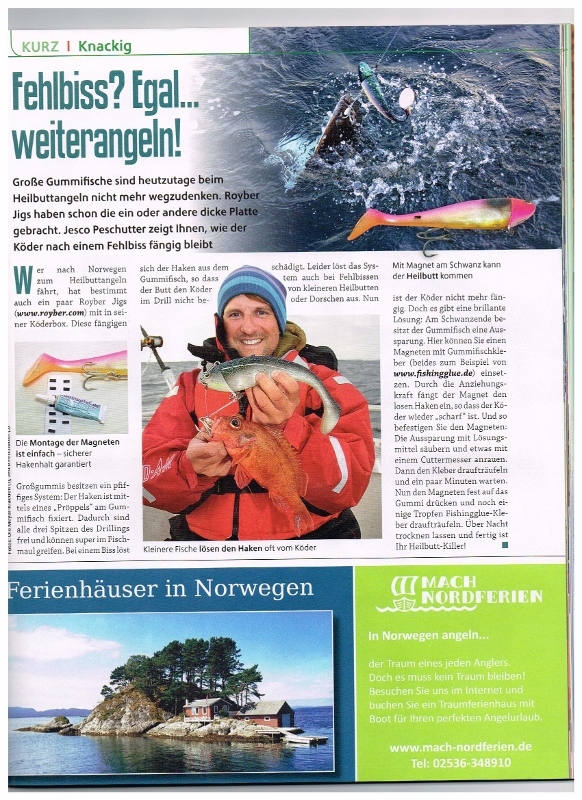 The magazin Rute & Rolle shows in its August 2013 issue in the "TESTED / practice" before the Stinger magnets. To read the report, simply click on the image. Our magnets are not just for pike, zander and Co. use. Also for sea fishing on the ROYBER rubber fish show their strength magnets "capturing" the triplets. To watch the video simply click on the picture. Now I use for almost 2 years at my shads the Stinger magnets and can now say with certainty that my catches have become much more with the appropriately prepared baits. The number of fish caught (also of bites) increased significantly compared to previous years. In the comparison I made ​​sure that I used the same Soft Baits. Whether it is due to the improved by the magnets hook and bait presentation or if the magnets we will continue to monitor through its magnetic field itself "curls". We would be happy if our Stinger Magnets also improve your fishing results. You are welcome to send by email your experiences. Since 01.03.2013 we can finally offer the Stinger magnets in the shop. We have come far in recent months. We developed a special plastic coating reacts with our Soft Bait Glue and the rubber fish usually so strong that there is a real welding of magnet and Soft Bait. To start from 01.03.2013 there is first the option "Vertical". During the month of March then the larger magnets "Spin & Jig" will follow. 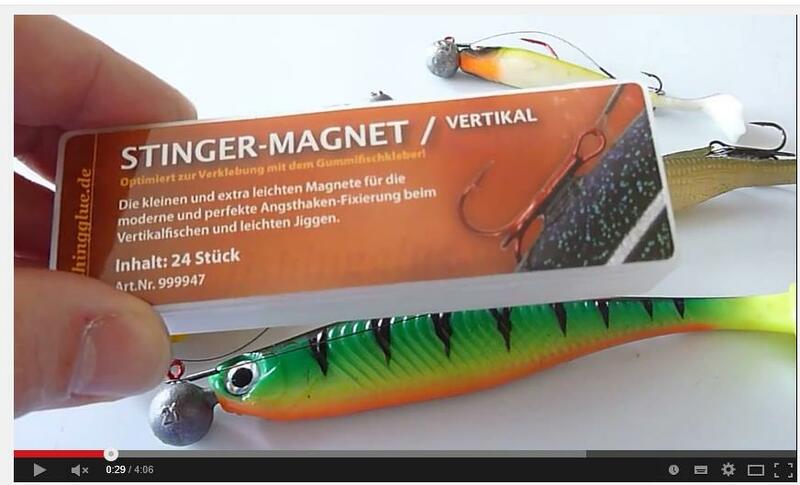 > Stinger magnetic spinning and Jig from extra-strong neodymium N52. This Stinger magnets are strong, yet lightweight magnets for modern and perfect fear hook fixation spin fishing, towing and jigging. > Stinger N52 neodymium magnet from vertical. The "vertical" are the small and extremely lightweight magnets for modern and perfect fear hook-fixing when vertical fishing and light jigging. Why do we develop ever Stinger magnets? • By inserting a hook in Shads often occur at the injection site deformities hamper the running properties of the bait. When using a magnet is the Stinger Drilling on the magnet and does not interfere with the running of the bait. This gives you the best bait action! • All 3 flukes of the three cards are exposed, as no fluke is inserted into the bait. Thus, you have a much higher yield bite! • In addition, the fear hook dissolves very easily in case of a attack of bait, as he was "knocked out" not only from the shad will be. The material of the soft bait and other factors that are hindering the trigger right away when it no longer. Thus you have thus a much higher yield bite! • Your Shads are less damaged. This saves money on new lures and time for repairs. • You can "move" the fear hook if required extremely well back. If then the hook of the Stingers still with the eye fixed on the magnet, you gain almost a full hook length to the tail end of the bait. To arrest even the most cautious predators.